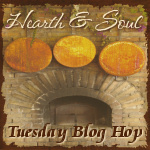 Welcome to the Hearth and Soul, the blog hop for recipes using healthy ingredients, family and comfort food recipes, articles about healthy living, real /slow/ local/sustainable food, foraging, herbal remedies, organics and gardening. I’m back home in near London, England after our visit to New York City and Ontario. We visited some fabulous restaurants in New York City while we celebrated our son’s 21st birthday and then worked hard to close up our Canadian apartment and get the furniture moved back to the UK. It should arrive in the next few weeks. We also had some nice visits with local family as well – definitely the best bit! It’s going to be a busy time as my husband and I are only home for a few days before we head off for another trip. I’ll definitely be making some of these Easy Suppers for Busy Evenings this week! Today I’m featuring some Healthy New Year recipe ideas from last week. I would love it if you would subscribe to my weekly newsletter – please sign up in the box just below the comments. You are having a busy new year! Hope you have a fun and safe trip, April. As always, thank you for hosting. So glad to hear you enjoyed NYC. Thanks again for a lovely party. Thank you, Diane, and it’s my pleasure! I stopped by to share two awesome meals this week…a whole tuna casserole made from scratch ingredients, and super quick and flavorful Paleo soup made with a molten egg! Thanks for the feature April! Your recipes sound delicious – I’m curious to learn more about the soup…I look forward to visiting your posts, Tessa! So many great recipes today….I am having fun checking it all out! Thanks so much for hosting! What a wonderful hop you are hosting! Happy New Year to you too, Deborah! Thank you so much for sharing a delicious recipe and a sustainable living post with us. I look forward to reading both your posts. Best wishes! Hello April! I’m new to your blog and to this healthy Hearth and Soul party. Happy New Year, and I’m glad you had such an amazing time visiting NYC. As a dietitian to be, healthy eating and living means everything to me. I’m linking up my sweet potato quinoa lasagna recipe, and look forward to checking out what others have brought to the table! Hi Min! Welcome! It’s lovely to ‘meet’ you 🙂 I love the idea of your tasty and wholesome sweet potato quinoa lasagna recipe and I’m so glad you have shared it with us at the Hearth and Soul hop. I’ve pinned it and shared a link to it on Facebook. Hope to ‘see’ you again next week! I hope you like black beans because I posted a very flavorful black bean burger.